New from Effed-Up Products: nature’s cruelest mistake is our latest t-shirt! 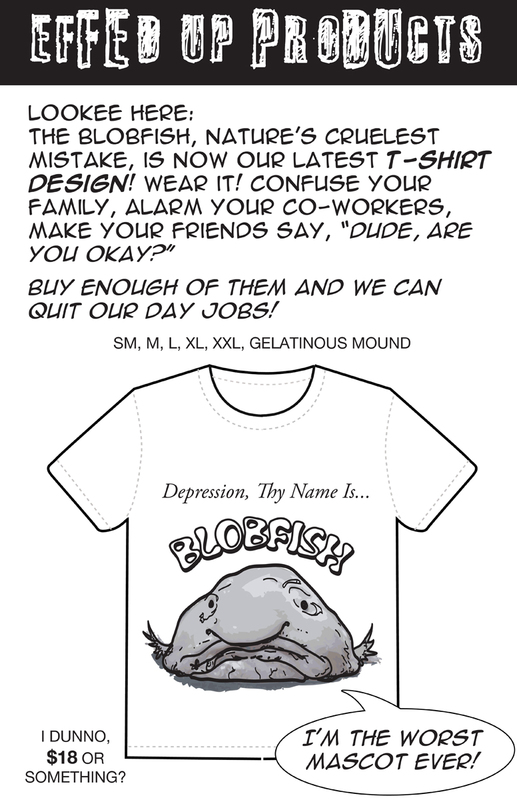 If Blobfish is the manifestation of depression, how horrible is the manifestation of Blobfish’s depression? This is a new type of comic we’ll be doing from time to time, quick little one-shots not entirely part of the ongoing story. One panel jokes or blatant attempts to create trendy t-shirts. ‘Cause nothing says trendy like a gelatinous blob. Also, in other news, I hit a pothole and my exhaust system fell out of my car. Next time: something completely different.